The MK studio reflector arm is a holder designed for the solo photographer or videographer in mind! It is very easy to assemble the reflector arm support system. In additions, great to use if you don't have an assistant, this setup makes solo photography fast and easy. ① Increased use purposes: 1/4 interface design, can be fixed lamp, flash frames, photography lights and other photographic equipment use. ② The versatile swivel joint allows positioning at almost any angle. Can freely rotate 360 degrees, adjustment depending on the angle of the fill light. ③ All-aluminum alloy, and more durable. Diameter is bold design and improve stability. This Reflector Arm is sturdy while also being light weight. The reflector Arm has easy to lock knobs for height adjustment. Solid locking system for light safety. ④ This product is stretch, and easy to carry. Quickly and easily fold up equipment for efficient storage & extension arm was designed to hold reflect disc and panel of different sizes and shapes. You also can adjust the length to accommodate the your reflectors. 【Made of All-aluminum Alloy Material】 This Reflector Arm has solid locking system for light safety and has easy to lock knobs for height adjustment. 【Allows Positioning at any Angle】 This reflector swivel joint can freely rotate 360 degrees, adjustment depending on the angle of the fill light. 【Stretchable, and Easy to Carry】 You can adjust the length to accommodate your reflectors. And the standard clip design is made to grip the frame on most reflectors. 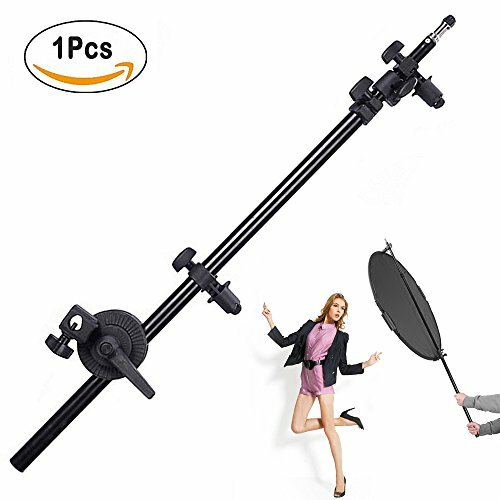 【Support for Connecting Various Photography Devices】 Reflector holder extension is long enough and 1/4 interface design, can be fixed Monolight, flash frames, LED video light and more device. 【Humanization Design, Upgrading the Comfort of Operation】 The unique reflector stand clamp allows for greater adjustment on which stands the reflector arm could connect to, even allows hand holding or table connection in the design. If you have any questions about this product by Meking, contact us by completing and submitting the form below. If you are looking for a specif part number, please include it with your message.